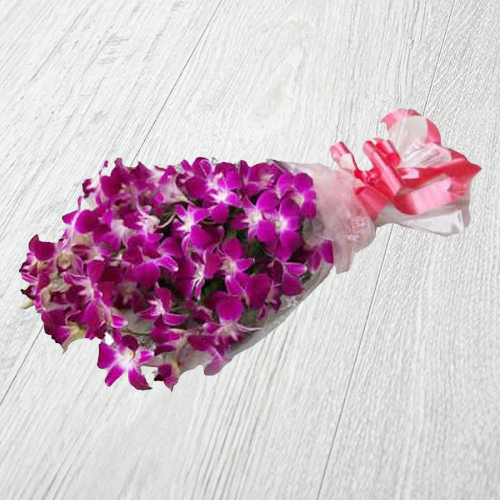 Amaze your loved ones by gifting them this Vibrant Blooms Purple Orchid Stems Bunch and make them crave for more. Long-lasting and requiring little care, our 10 Purple Orchid Stems is an exceptional gift for any occasion which comes with a lovely Ribbon design. Flowers Delivery Pathanamattita, Send sweets Modinagar, Wedding Cake Bilimora, Diwali Mithai Dehradun, Send Flowers and Gifts to Sivakashi, Online Shop Gopi, Flower to Tonk, New Year Flowers Kota , Fresh Fruits Barrackpore, Send Gift Thirualla, Dry Fruits to Karnal, Birthday Delivery Jhalawar, Sending to Pali, Flower shop Haridwar, Mumbai Online Cake Delivery.